True, it’s been a very slow start to the 2016-17 ski season, with several Colorado ski resorts postponing opening days, but the good news is that’s all about to change later this week, with a blast of winter rolling in Thursday — just in time for opening day at Keystone, Breckenridge and Copper Mountain. 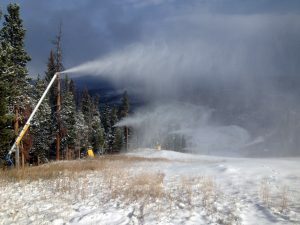 Snowmaking at Keystone, which opens for the season on Friday, Nov. 18 (Keystone photo). Keystone announced last week that it will open for the season on Friday, Nov. 18, with Breckenridge now opening on Saturday, Nov. 19. Both resorts were originally scheduled to open Friday, Nov. 11. Copper Mountain also pushed back its opening day to Friday, Nov. 18. Loveland and Arapahoe Basin are already up and running on mostly man-made snow. Vail Mountain, originally slated to open Friday, Nov. 18, has set a new opening day of Friday, Nov. 25, and Beaver Creek is still scheduled for a Wednesday, Nov. 23 opening day. Meanwhile, other Vail Resorts mountains will be up and running this weekend. Breckenridge cranks up its lifts on Saturday. That pattern is likely to continue next week. But a change in the weather pattern may come too late to save the early-season World Cup ski racing schedule that traditionally swings through the United States and Canada in late November and early December. According to the Vail Daily, World Cup ski races scheduled for Nov 26-27 at Lake Louise, Alberta, Canada, have been canceled by the International Ski Federation (FIS) due to warm weather and a lack of snow. FIS officials will assess the Birds of Prey course at Beaver Creek on Friday, deciding whether to go forward with World Cup races scheduled there for Nov. 29 – Dec. 4. Vail Valley Foundation officials told the Vail Daily the races will go on despite conditions similar to Lake Louise. The season has been slow to kick off in Utah as well, with Park City Mountain officials announcing Monday that the resort’s opening day, originally planned for Friday, Nov. 18, has been rescheduled to Saturday, Nov. 26. Rock pointed out that a slow start to the ski season does not mean it will be a low snow year. “It’s important to remember that during the 2008-09 season, Park City Mountain rescheduled opening day to after Thanksgiving and ended up with 444 inches at the Jupiter snow stake. The average at that stake is 357 inches,” Rock added.